The 47LA6200 differs from the 47LA6900 in that it does not have the Cinema Screen razor thin frame design or Magic Stand for 2013/2014. It does have 120Hz panel, 1080p, Smart TV, passive 3D TV, a dual core processor, and a great value to price proposition as a result. The not-yet quintessential but compelling Magic Remote is optional with this TV. This can be a very negative area of picture performance for LCD TVs. On the 47LA6200 viewing images from side angles is very impressive. The clear screen does allow for some glossy reflection but does a nice job from side angles even though there is still no comparison with plasma TVs. One of the primary problems with viewing angle issues is that the contrast and black levels degrade. This happens at about 25 degrees on the 47LA6200 but is not severe as it is with many LED TVs. Verticle angles suffer as well. Keep this in mind if the LA6200 is going to be mounted above a fire place. The LG 47LA6200 has a dedicated picture preset for gaming. I really like it because it isn't buried in the menus. Sometimes these settings are hard to find. In this picture mode, the input lag is significantly cut down. Our testing results show around 30ms. This is a perfectly acceptable result for action games and first person shooters. The motion blur and judder really increase in the Gaming picture setting. This is where the LA6200 loses marks for gaming. First off, remember that the Magic Remote is optional for a price. It costs around $100, but if you will be utilizing the Smart TV features and web browsing a lot on this unit then it's worth it. This has been one of our favorite features of LG TVs for the past two years. The Magic Remote is one of those value-add features that actually works and creates value although this one has a voice-command option that we feel may not live up to expectations. That aside, the point and click operation of the Magic Remote definitely speeds browsing and makes surfing the Internet much more enjoyable. We have come across 5-way controllers recently that just are not even worth trying to browse with. To see our full review of the Magic Remote refer to the LG 55LA7400 review. The 47LA6200 is loaded with Smart TV features not found in previously in LG TVs. 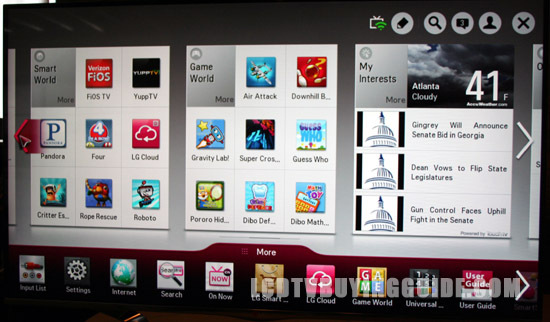 The experience of the user has been granted the most attention when designing the Smart TV platform. The familiar Smart TV suite is in place with some enhancements over past iterations. The first new thing you'll notice is the “My Interest Cards” placed on the home dashboard. These allow you to customize the easily accessed apps and display things like real time weather or news from your favorite sites. The LA6200 has nice clean lines and a half inch black frame. The stand is, um, updated? Kind of bottom of infinity shaped. 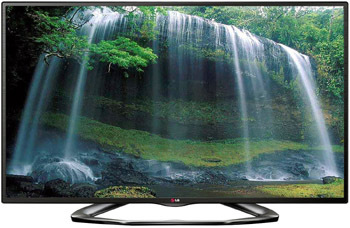 There are not too many quality 47 inch TVs in the market this year. The 47LA6200 offers a very good option in quality and value. Competition is from the Samsung UN46F6400 or UN46F6300. Get the Magic remote option and you've got an awesome and fun TV.